When the folks over at KCRW’s Good Food asked me if I could contribute a recipe to their popular Pie-A-Day blog, I was thrilled. …I was thrilled, and then confused—what recipe to choose? Seasonal? Classic? Fruit-based? Chocolate or peanut butter? I decided on retro—it just felt right. 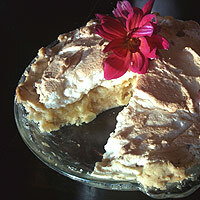 I also knew I couldn’t write a recipe without explaining the significance of pie for me, personally. It’s quite possible that my entire life path was forged over the flour-dusted kitchen counter at my childhood home in Sacramento. Read all about it, and why in the world my recipe comes via Vincent Price, over at the Good Food blog.